MSNBC’s newest liberal darling Ronan Farrow paid a visit to Comedy Central’s “The Colbert Report” on Tuesday night, and the daytime MSNBC host was hilariously mocked by the liberal comedian during the entire segment. While the rest of the interview focused primarily on Farrow’s goals for the show, this brief back-and-forth exposed the hilarity of MSNBC hiring a 26 year old to host a daytime cable news show. Even though Colbert is actually a liberal, he beautifully pointed out how desperate MSNBC must be to hire a kid who could still be on ObamaCare to anchor one of its news shows. However, despite his age, Farrow appears to be no different than his fellow liberals at MSNBC. In October of last year, the MSNBC praised how “The Clintons represent a style of honesty that the public craves right now.” In addition, In January Farrow disgustingly compared a war hero’s struggles to congressional bickering, commentary that should help him fit in nicely with the rest of the “Lean Forward” crew. STEPHEN COLBERT: Welcome back, everybody. My guest tonight is a Rhodes Scholar who graduated high school at 11, college at 15, and went to law school at 16. He’s known mostly for his tweets. Please welcome Ronan Farrow. Thanks for coming. Now, as I said earlier, you're a Rhodes Scholar. Yale law School grad. Served for two years as a U.S. Diplomat in Afghanistan. 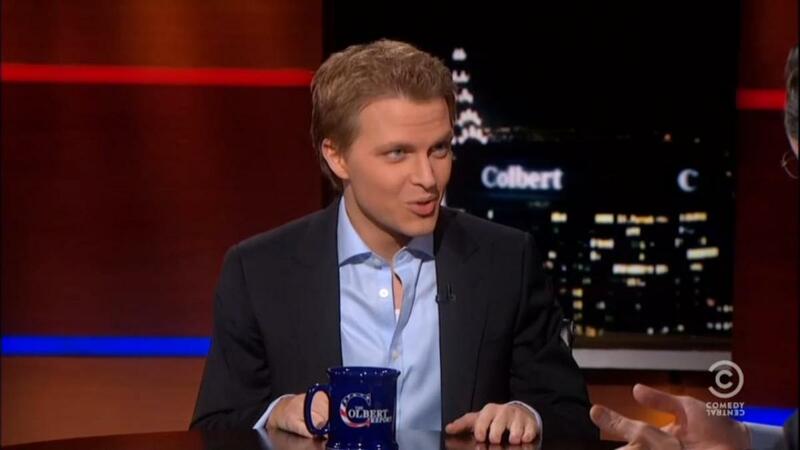 Now at age 26 you're the host of "Ronan Farrow Daily "On MSNBC daily. Every day. COLBERT: 1:00 P.M. weekdays to appeal to the youth demographic of people who are just waking up from not getting to their jobs. FARROW: Let me stop you there. COLBERT: It’s the youth demo. You’re a youth. FARROW: Look, I’m still waking up at 1 p.m. It is not a youth show. It is a show that I think-- and we see this in actually our digital audience which has been incredible. Connects with my generation in ways that are a little different. COLBERT: What generation is that? What generation is that? FARROW: Strange people who have worked in Afghanistan and at the State Department and now run a TV show? But that's the target demo. COLBERT: You speak for all Rhodes Scholars who have been diplomats. FARROW: For all Rhodes Scholars I’m the universal voice of the Rhodes scholars. COLBERT: But you’re hired. They’ve got you in there. You’re 26. You’re 26 years old. COLBERT: Okay, they hire mostly at MSNBC to be shills for the left. Are you a shill for the left? FARROW: I mean look, I could secretly be an O'Reilly type. You’re papa bear. You are my papa bear. I was told not to pander. COLBERT: Really? You’re welcome, you’re welcome. What do you hope to accomplish with your show that you couldn't do with new media? Because you young people-- how old are you? COLBERT: 26. You could actually still be on your mother's health insurance thanks to ObamaCare. FARROW: It’s true, true. Right, isn't that a wonderful thing?